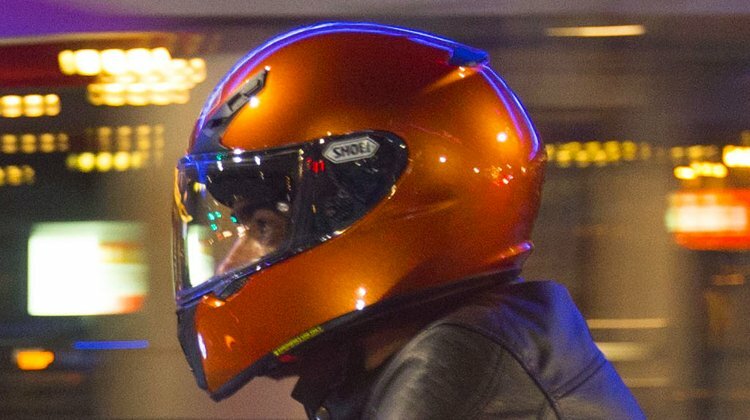 The Shoei RYD is our favourite full-face helmet. We like its smooth, rounded profile that means you can wear it on just about any bike. It’s light, well vented, comfortable, and with a variety of cheek pad options we can make it fit just about everybody. It is priced at £300 and, quite honestly, if you paid twice as much you would get nothing more. In some cases, you’d get a lot less! The only weakness with the RYD is the omission of a drop-down sun visor. Shoei’s mistake we reckon. But they do offer a brilliant photochromatic outer visor that darkens in the sunlight. Problem is; at £150, it’s silly money. But when you buy a new RYD from us, we’ll fit a replacement visor for just £90. So a total cost of £390. Considering that, a month ago, before Shoei reduced the price, the cost of the RYD was actually £350, we reckon it represents a terrific deal. Soubirac is a French company that has been making boots for the equestrian world since 1886. They’ve not been making motorcycle footwear for quite so long, but these guys know how to make a boot. Their Klipper 3 looks as though its going to be incredibly heavy, but it’s actually not. Tough it is though, with a commando-style sole and reinforcements in the ankle, heel and toe areas. 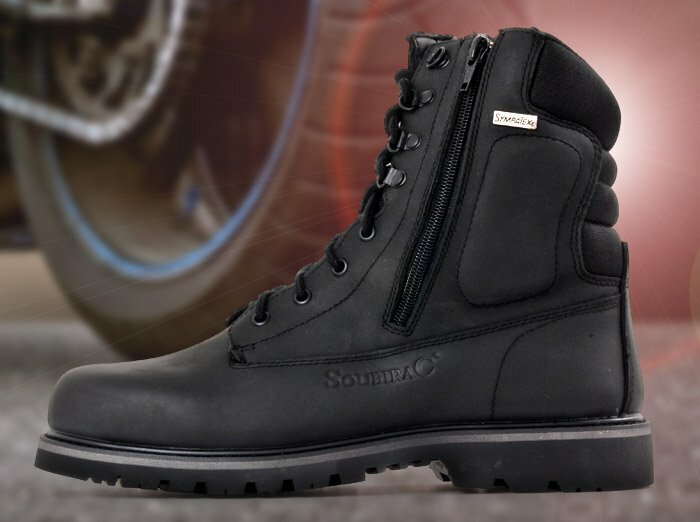 The Soubiracs also come with a fully waterproof Sympatex breathable lining. Now boots with side zips are always popular because they’re so much easier to get on and off. For the first week or so, you might use the laces, but after that you can normally just use the zip. What makes the Klipper 3s so different is that they actually have two zips. It makes them even easier to get on, and if you’ve got wide feet or a high arch, they’re often the best option. They’ve just come back into stock, and we’ve got them in all sizes. We’ve just had in a new delivery from our French friends at Helstons. We had been short of a few sizes in the Ace Vintage and Cruiser jackets, but those gaps have now been filled. In the delivery was a brand new jacket called the Gang that is loosely based on the style of a US Navy A2 jacket. The oiled and waxed leather has a lovely patina to it. The collar can be removed, of course, and as with all Helstons’ jackets, you get full armour including a back protector. For warmth, the Gang has a full sheepskin waistcoat, and even though we’d never suggest a leather jacket for riding in the rain, the Gang also has a waterproof membrane. On the delivery we also received a lovely new summer weight glove called the Charly. At present, it’s in black only. Brown will follow shortly. 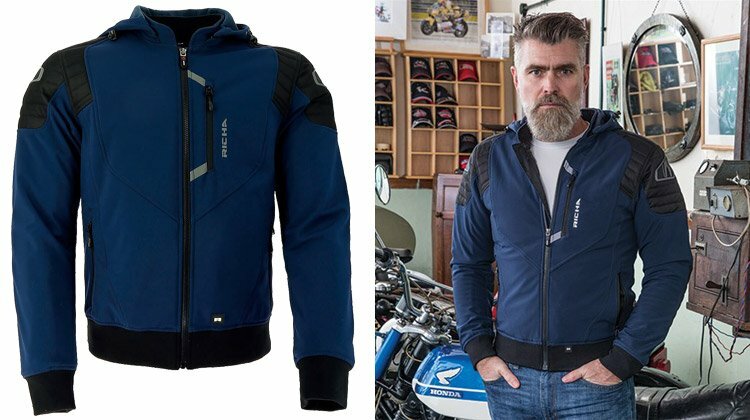 Ever since Rukka equipped its top-of-the-range Nivala jacket with a separately worn, duck-down, inner jacket, it’s become clear that this is the way forward for keeping warm on the bike. The Rukka Down-X jacket is lovely and light and very warm, but at £156 it’s not exactly cheap. Well now Spidi has brought out a similar jacket. 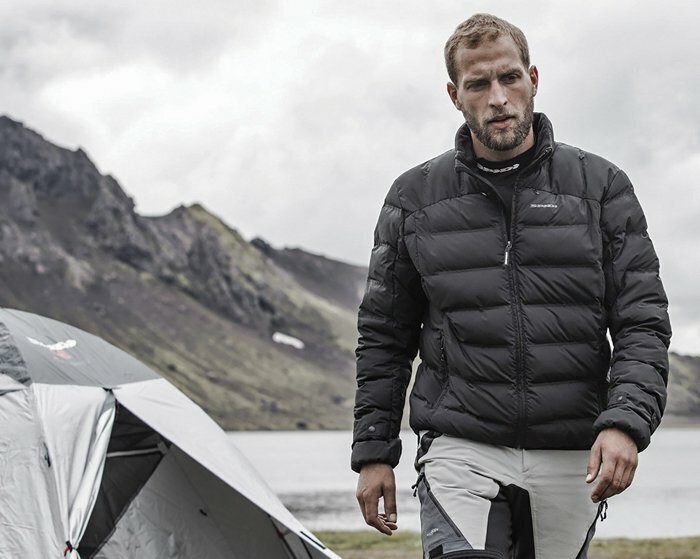 It’s got a 150 gramme thermal interior as well as a windproof lining. It will compress nicely under any motorcycle jacket, and is guaranteed to keep you nice and toasty. It has clips to clip it to any Spidi jacket but clearly it can be slipped on under any jacket. It can also, of course, be worn on its own. The price is £120. 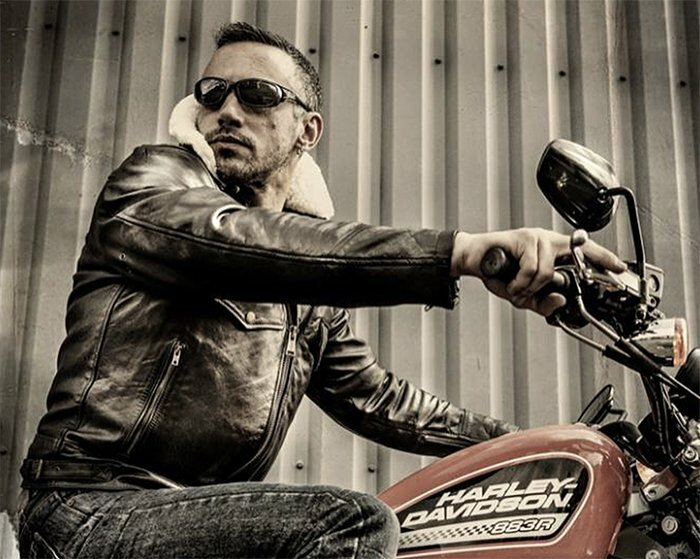 Here at Motolegends we are often drawn to clothing that’s a bit different, and certainly Richa’s new Atomic jacket is not like most motorcycle jackets. It’s been designed for spring and summer riding, and for these who want to adopt a particularly casual and laid back attitude. But it is, nevertheless, a jacket that is perfectly up to the job of urban riding. Made from a softshell fabric, it’ll keep you pretty warm, but not so warm that you couldn’t ride in it on a summer’s day. For protection, the Atomic comes with D30 armour in the elbows and shoulders, and there’s a pocket for a back protector. The hood is removable. The sleeve ends and hem are made from a French rib, and you get a heavy-duty, water resistant zip up the front. If you don’t want to telegraph the fact that you’re a biker, the Atomic might just hit the spot. 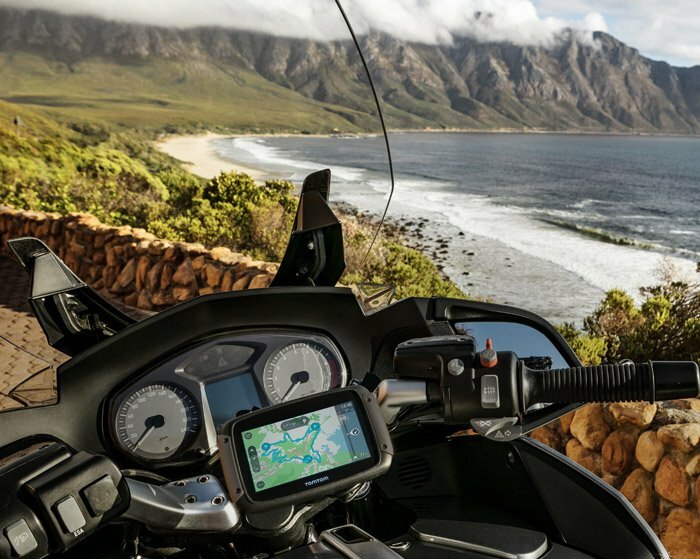 In just a few short years, TomTom has taken over the market for motorcycle sat-navs. And, as far as we’re concerned, that’s solely on the back of better, more feature-laden, cleverer and more intuitive products. These guys simply produce a better device. But in a few weeks’ time, they’ll be launching a brand new model that is even more competent and usable. And we reckon it’s worth waiting for. Now, as ever, it’s got some features that are going to go over most people’s heads. The new 550 will allow you to use Siri for calling, messaging, checking the weather, and so on. But the new TomTom will also update its maps via built-in WiFi, so when an update becomes available, you simply connect and download. The 550 is also powered with a fast, new quad-core processor, meaning that it will run even faster than before. Of course, you still get all the usual gubbins: lifetime world maps, and lifetime traffic updates, allowing you to avoid traffic in real time. 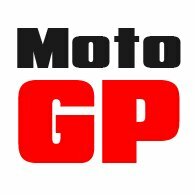 It’s just like the previous 450; you just get more and better including, with the Premium model, a motorcycle mount, a RAM mounting kit, a car mounting kit, an anti-theft fitting, a cuddly toy and a protective carry case. (You don’t actually get a cuddly toy; we were just checking that you hadn’t nodded off). Anyway, by the time you read this bulletin, the new 550 should be on its way to us. It’s due this week; next week at the latest. All we can say is that we think that it’s worth waiting for.